Since its inception in November 2006, the Man Recordings vinyl series Funk Mundial has pushed the boundaries of what is called „Brazilian Music“. For the series, Man Recordings boss Daniel Haaksman comissioned some of the world’s hottest producers in electronic dance music to collaborate with various hand picked baile funk Mcs from Rio. Artists like Crookers, Feadz, Jesse Rose, Count+Sinden, Seiji, Scottie B, Riva Starr and Stereotyp created a new mysical hybrid: Funk Mundial, the international interpretation of Rio De Janeiro’s 21st century big booty party music. 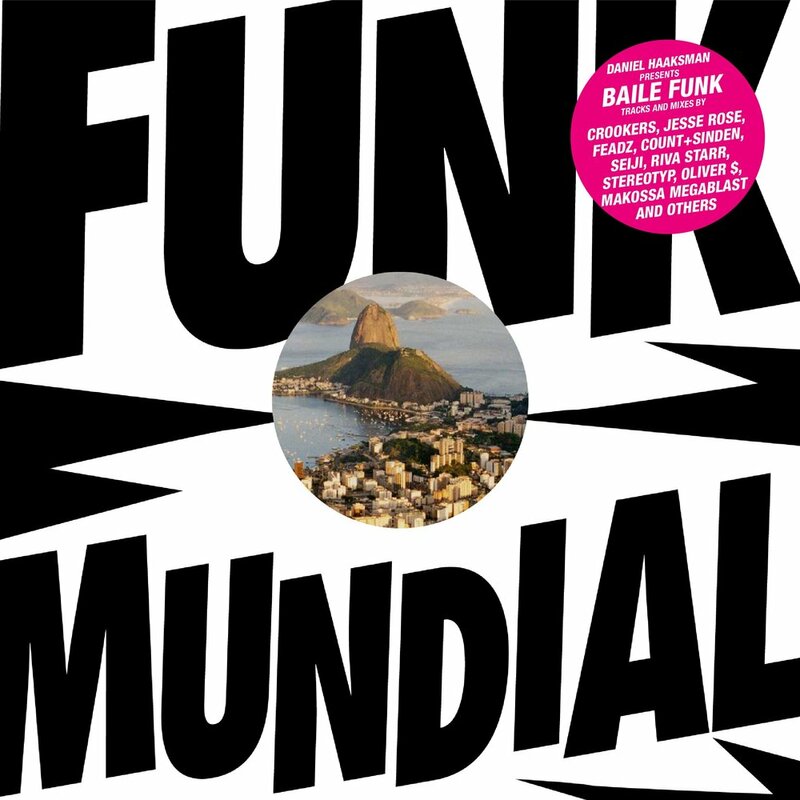 The compilation presents for the very first time – a world debut – the global view on the Brazilian music phenomenon called baile funk – in Brazil simply named „funk“. The tracks in the compilation stem from producers from across the globe. Featured are producers from cities such as Paris (Feadz), Milan (Crookers), London (Count+Sinden, Seiji, Riva Starr), Berlin (Jesse Rose, Oliver $, Daniel Haaksman), Vienna (Stereotyp, Makossa Megablast), Chicago (DJ C) and Buenos Aires (El Rémolon, Chancha Via Circuito, Frikstailers). Thus, in their Funk Mundial contributions, they added their particular local club music flavour to their exclusive productions. You can find a speed garage banger (Count+Sinden’s „Tamborzuda“) that fuses London’s hi speed and heavy bass club sound with a baile funk MC contribution by MC Thiaguinho. The Funk Mundial compilation features the West London broken beat of producer legend Seiji (producer for Bugz In The Attic and Roisin Murphy), teamin up with one of the experienced Mcs in the Rio Baile Funk biz, MC Dolores. There’s the Parisian producer Feadz – the producer of teen idol Uffie, of Edbanger Records fame – who worked for his Funk Mundial track with 8 year old MC Wesley, a child MC from Rio, and added his high-quality beat- and analog synth skills. Mashing up classical European music with heavy Miami beats. The compilation features the club anthem „Soca Ali Baba“ feat. MC Dandão by Italy´s Crookers, who recently rose to world fame with their remix of Kid Cudi’s „Day+Night“. Another outstanding track is house music’s leading DJ and producer, the Berlin based Jesse Rose and his coop with Deize Tigrona, the queen of baile funk. Plus there’s many more tracks and collaborations by Makossa Megablast, Stereotyp, Oliver $, DJ C and the brain behind this outstanding musical project – Daniel Haaksman. Get ready for the global remix of Rio Baile Funk: Funk Mundial – 16 amazing fresh tracks, that make any party rumble. Brazilian music never sounded hotter.